Birch is a beautiful tree, and many gardeners do not mind to put him in his place. But here the question arises. How to organize the moving of seedlings from the forest, so he quickly got accustomed on a new place? In the cattery you can buy a seedling of different species of birch paper, dalecarlica, Daur, American and many others. But if you want to put the beauty of Russian forests, silver birch, dig the wild natural planting. Transplant birch choose the best time in the Middle of Russia - in the early spring, when the leaves have not dissolved. But you can do it in the fall, though there is the risk that the bad seedlings will survive the winter. Find along the roadside or abandoned fields small wildings and select the ones that you will like the most. Overgrown trees, more meter, better not to take, they survive much worse. Obamaite bayonet spade the ground around the sapling. Try not to damage the long lateral roots, although birch is not capricious in this regard. Now start to bury the shovel under the main root and, using force, pull the tree from the ground. Easier to do this with the assistant. Try to keep the clod of earth on the roots. For small enough 20х20х20 half-meter saplings. Wrap the roots with a lump of earth with foil or place in a bucket, and then can bring the birch to the new location. Select a well-lit place in your garden, then you can count on the fact that will grow a beautiful spreading tree with long drooping branches. In the shade under other trees such effect from drooping birch not wait, she will be very drawn out, and the crown is formed only on the top of the barrel. Dig a hole, place in it the roots of the trees and fill garden soil, humus, sand and peat, taken in the ratio 2:1:1:1. If you plant a birch in the spring, you can add 200 g of complex fertilizer. And if the fall – phosphorus-potassium. The care of transplanted birch is regular watering, every 3-4 days. 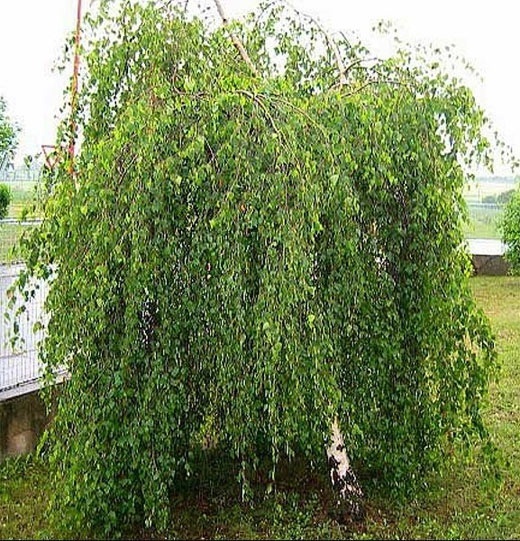 In subsequent years, fertilize the tree regularly and watering during dry years, birch loves water.